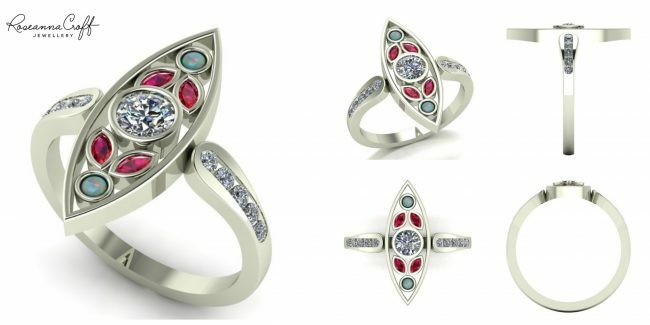 A couple of months ago the team at Rosanna Croft Jewellery got in touch to see if I would like to be part of the new bespoke design experience at their Bakewell studio. I do love jewellery, who doesn’t right? I have a few lovely items in my jewellery box, plus my engagement ring, wedding band and eternity ring, which I wear all the time. So, of course I wanted to have a bespoke design experience, you never know I might not ever be able to experience this again. I headed over Bakewell in Derbyshire to meet with Roseanna herself, to find out a bit more about her and Roseanna Croft Jewellery. 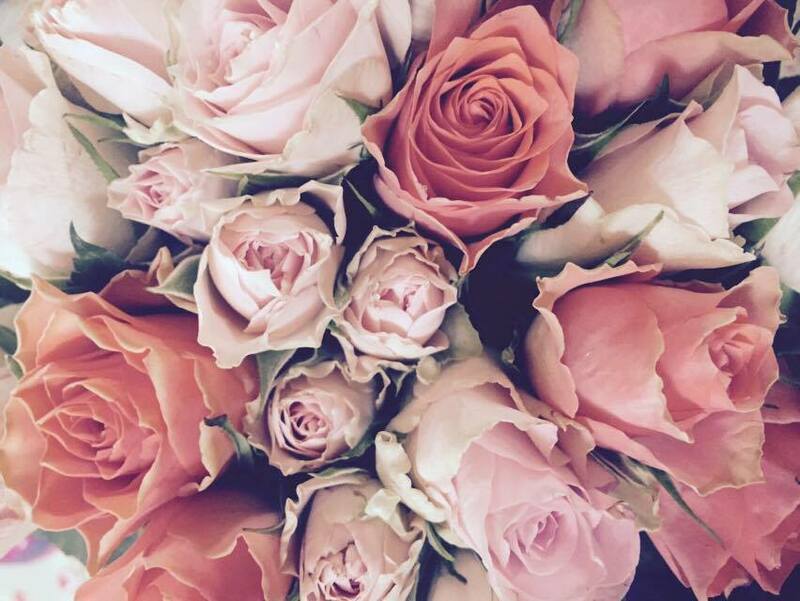 Roseanna, studied Jewellery design and manufacturing at university and then went on to travel the world working within the jewellery industry. While in Australia, Roseanna picked up a beautiful black diamond, I was luckily enough to be shown it while at the studio. Having not seen a black diamond before, I was blown away with the cut and the way the light reflected from it, just stunning. Roseanna is also Princes Trust young ambassador, she has recently attended the Garden Party at Buckingham Palace for Prince Charles’ 70th birthday, I am very jealous. I would honestly love to attend a Garden Party at the Palace one day. As we got talking about both of our loves for luxury items, we started to discuss what style of jewellery I like and the style of piece I would love to design. I already knew that it was a ring, that I had my heart set on designing with Roseanna. For a long time I have wanted something that represented my children. I have been looking for the last couple of years for something that did just that. I love the vintage style, so I am always looking in second hand jewellery shops and antique stores to find something, however I still have not found exactly what I have been looking for. This bespoke design service is perfect when you know you want something but haven’t quite found what it is yet. As my son’s birthday is July, Ruby is his birthstone and my daughters birthday is in October so Opal is her birthstone. I felt like this would be my perfect opportunity to design a luxury item of jewellery that represented them both and have it’s very own story. Roseanna Croft Jewellery offers a unique champagne afternoon tea design experience, which we booked in for a couple of weeks later. Roseanna Croft Jewellery’s bespoke service gets booked up, so to get the day of the week suitable for me I needed to wait a couple of weeks. It wasn’t an issue, I gave me time to put some ideas together and email some over to Roseanna before going back. Rosanna believes that ‘every piece of jewellery tells a story’ so with every piece of bespoke jewellery made, they produce a story card along with a valuation of your item. 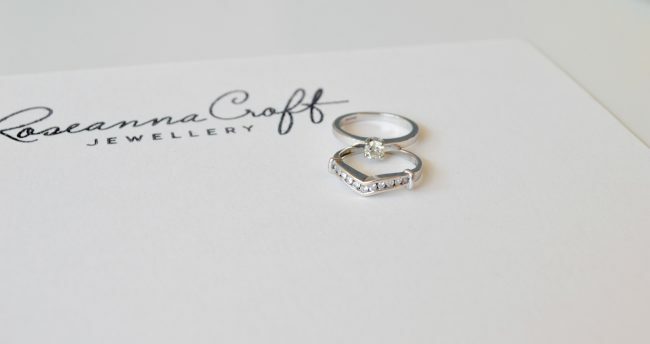 I was really looking forward to working with Roseanna Croft jewellery and having my bespoke design experience. I arrived at the studio in the heart of Bakewell, to be greeted by the lovely Roseanna who had a glass of champagne to hand to me as I arrived. While I made myself comfortable she went out to the back of the studio to finish preparing the afternoon tea. 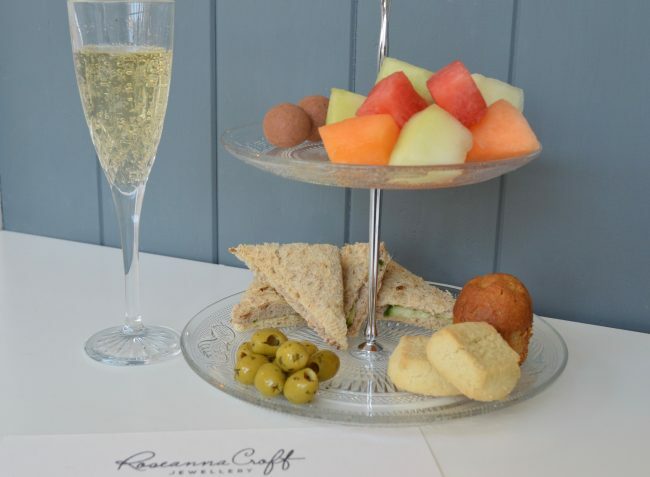 Sandwiches, olives, mini shortbread, mini muffins, fresh melon and delicious champagne truffles, all serviced on a vintage style cake stand. I don’t actually eat olives, but everything else looked and tasted lovely. As we set about looking at the different style rings that I liked, it became quite clear I wanted a statement ring. Something that I would probably never find anywhere else, something people would remember and ask where it came from. I felt drawn to the rings that I can only describe as a shield, something marquis shaped, but not as a single stone. 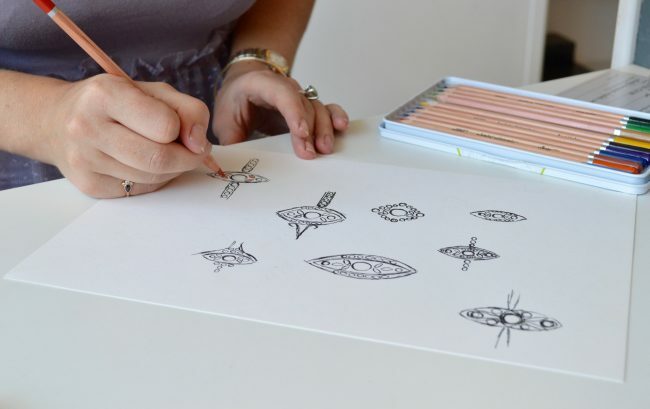 As Roseanna put pen to paper, she started to sketch a couple of styles out. We spoke about each one and then designed another, I also spoke about my ideas as we went along. Some good, some ……… well, lets just say there is a reason I do not design luxury jewellery. We continued looking at different styles, talking about what worked, until Roseanna had designed something that I loved, something that no one else would have and something that was perfect for me. Even though I had made a few different suggestions, most didn’t work however, Roseanna put me at ease to be able to come up with ideas and she never once made me feel silly for making a suggestion. I’m sure Roseanna knew they wouldn’t have worked but she sketched them down and we discussed each one as we went along. 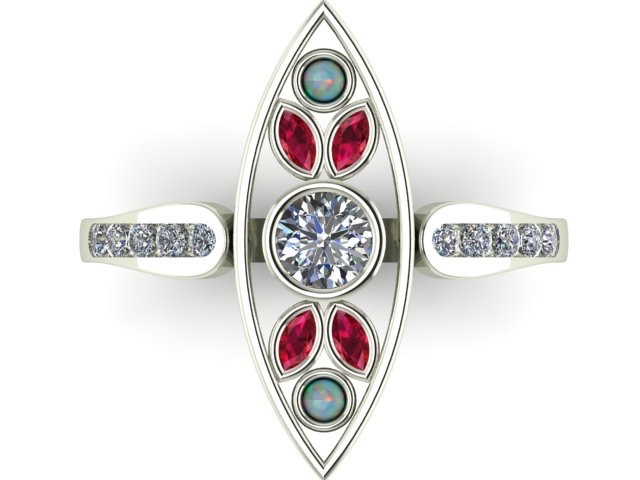 Roseanna felt that using the diamonds from my other rings would work beautifully within the ring design I had chosen. When we were both sure it was what I had been dreaming about, Roseanna added colour to the sketch so I could see the placement of the Rubies, Opals and Diamonds. The sketch was then turned over with a few details written on the back, about the stones, the metal I had chosen and also my ring size, which Roseanna sized for me. Although at this point I wasn’t sure about white gold or yellow gold. As I wasn’t 100% sure about the metal for my ring, we discussed how yellow gold would help the Rubies to stand out, but make the diamonds slightly yellow looking and how the white gold would make the diamonds sparkle more. As it is quite difficult to visualise, Roseanna offered to send me the computer generated image of the ring in both yellow and white gold. Perfect. At Roseanna Croft Jewellery they work to a 6 week turn around from your jewellery design experience to taking your item home, of course that depends on how easy people find it to decide on the item they would like made (I did not), and also depending on the jewels as some have to be specially sourced from across the globe for these bespoke pieces. As I finished off my second or third glass of champagne and nibbled at the afternoon tea, while chatting away about the Royal Wedding and Royal engagement rings over the years. Roseanna explained that after the appointment, she would design the ring on the CAD computer system, which allows you to see something in 3D image before actually making it. It would then be emailed over to me to look at and see if I would like any changes making. After I said good bye, I couldn’t wait to see the design. Within 5 days my design arrived in my inbox. As promised in both yellow and white gold. Wow! The yellow gold as you can see, just didn’t quite have the same feeling to me. 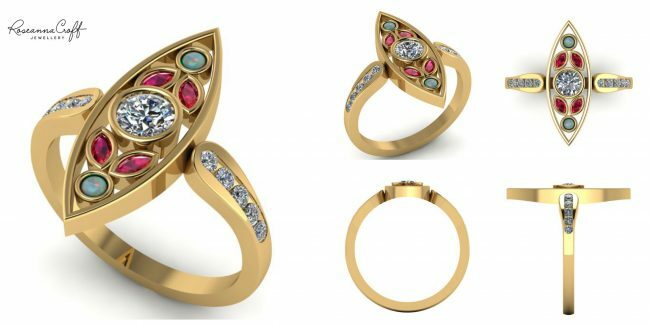 I felt like that yellow gold made more of an impact that the setting of the stones and I wanted to stones to be the standout part. What do you think? I am very indicieve about things, and I just wasn’t 100% sure about the placements of the rubies, so I asked Roseanna is she would be able to put together an image of them flipped around. It was no problem, Roseanna was more than happy to adjust the ring. A couple of days later another image arrived for me to look at. I will be honest, I had had both of the images for a week or more and I still did not know which I loved more. I asked my hubby, my friends, my sister and my brother-in-law who has a great eye for design yet I still couldn’t make my mind up. So I contacted Roseanna back again, to ask for the size of ring so I could visualise it even more on my finger. Roseanna said to me to try not to over think it and go with what I love, she also offered to see me again to re-design if I wanted to. I knew I loved the rings, just I wasn’t to sure which one I loved that bit more. In the end after almost two weeks of comparing the rings and writing this post, I have finally decided on the first design that Roseanna put together for me. I felt like it was more balanced and I love it. Now, I cannot wait to see the process of my gorgeous ring being made, I will be going over to the studio again to see some of the stones being placed and to see how it is all made. 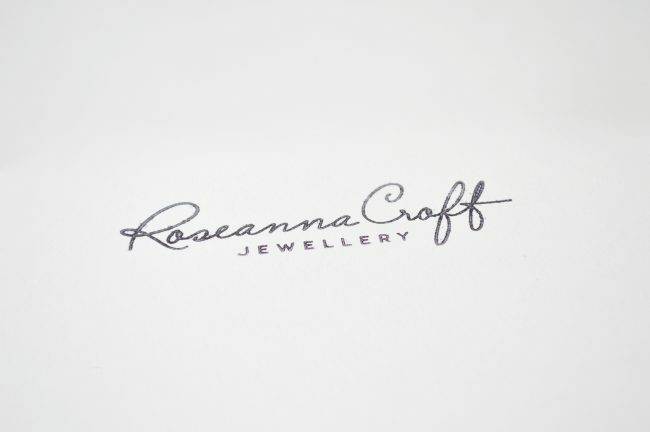 I will share the rest of my jewellery design experience at Roseanna Croft Jewellery, when I have collected my gorgeous ring. I cannot wait. A fabulous experience, what a special piece of jewellery! Look forward to seeing the finished piece! This looks amazing I am so jealous! !